Pictured are (front) Senator Addie Eckardt; Mrs. Alice Clark; Mrs. Courtney Clark-Pastrick; Dr. Robert Lilly, Breast Center medical director; Kimberly Kratovil, Eastern Shore field representative for Senator Ben Cardin; Denise Lovelady, community liaison for Congressman Andy Harris; (back) Graham Lee, vice president of philanthropy, UM SRH; Ken Kozel, president and CEO, UM SRH; Moorhead Vermilye, vice chair, UM Memorial Hospital Foundation; John Dillon, chairman, UM SRH Board of Directors; Linda Prochaska of Senator Barbara Mikulski’s office; Jennifer Williams, vice president, Talbot County Council; and Delegate Johnny Mautz. 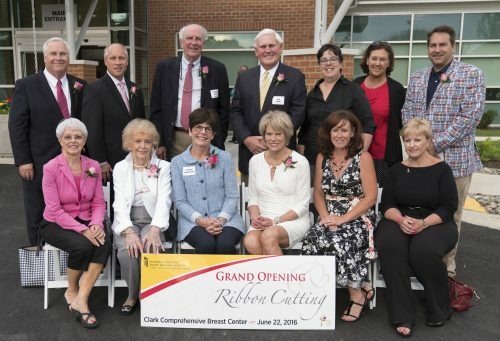 University of Maryland Shore Regional Health hosted a Grand Opening and Ribbon Cutting Ceremony at the Clark Comprehensive Breast Center on Wednesday, June 29. In its newly expanded location, at 10 Martin Court in Easton, the Center is named in recognition of a $5 million gift from The Clark Charitable Foundation, a private philanthropic organization funded by the A. James Clark Family. The expansion was part of a $6.5 million renovation project at UM Shore Regional Health’s Diagnostic and Imaging Center, housed at that same location. The 16-month project, which began in February, 2015, was completed in three phases and in addition to the expansion of the Breast Center to its new location, encompassed all laboratory and imaging spaces. An employee appreciation event was held on Thursday, June 30 to recognize Diagnostic and Imaging Center and Breast Center team members for their hard work, cooperation and dedication during the renovation project. For additional Information about available breast health services or to schedule an appointment, call the Clark Comprehensive Breast Center at 410-820-9400. Information about services offered at the Diagnostic and Imaging Center can be received by calling 410-820-7778.